In advance of the launch of Equality Works, the 2019 Global Health 50/50 report, featuring new data on the commitment of global health organisations to preventing and addressing instances of sexual harassment, Mireille Evagora-Campbell highlights recent examples of policy progress. The stream of sexual harassment and assault allegations in recent years has proven that many development actors, including those working in the field of global health, have a long way to go towards realising an environment which provides equal opportunities to all and welcomes and empowers individuals irrespective of their gender identity. In order to achieve gender equality within global organisations active in health, it is essential to combat workplace sexual harassment and it is therefore imperative for organisations to provide policies that effectively address and prevent all instances of sexual harassment. In most countries where leading global organisations active in health are headquartered, the law holds employers liable for acts of sexual harassment committed by their employees unless the employer can show it has taken reasonable steps to prevent harassment from occurring. In practice, this somewhat ambiguous legislature means that, while many employers provide a sexual harassment policy as a measure to prevent and effectively deal with sexual harassment, we see a great deal of variation in the comprehensiveness and implementation of these policies. Broadly speaking, to be effective in preventing instances of sexual harassment, a policy should both arm employees with the knowledge needed to recognise and respond appropriately to instances of sexual harassment and cultivate a culture of zero-tolerance towards sexual harassment. Effectively uprooting deep-rooted structures of systematic discrimination and attaining an environment free from all forms of harassment is indeed a process that will require a great deal of hard work and persistence, but one that is by no means impossible. Such a shift will result in transformative outcomes in the workplace that will benefit all individuals as we witness the adoption of a work culture centred on respect and inclusivity that promotes productivity and maximises impact. With this in mind, we would like to draw attention to a few positive and inspiring points of progress in the movement to combat sexual harassment. Firstly, in December 2018, the UN published a landmark model policy on sexual harassment with the aim of strengthening policies throughout the UN system. Not only does the policy comprehensively cover the essential features of any sexual harassment policy, such as a definition, commitment to non-tolerance and reporting procedures, but it also emphasises some factors that are essential to recognise if we are to effectively address sexual harassment. The model policy compels us to recognise the structural causes of sexual harassment, stating that ‘sexual harassment is the manifestation of a culture of discrimination and privilege based on unequal gender relations and other power dynamics’. It stresses the importance of accountability and zero impunity for those in power, and has a strong focus on prevention, framing the obligations of all staff as those necessary to prevent harassment in the first place. The publication of the model policy, which serves as a valuable resource for all organisations reconsidering their sexual harassment policies, follows the first ever adoption of a resolution on Sexual Harassment (A/C.3/73/L.21/Rev.1) by the Third Committee of UN General Assembly. It should be noted that while the UN General Assembly resolution addresses only harassment of women and girls, GH5050 advocates a more comprehensive approach that addresses sexual harassment of all individuals, irrespective of their gender identity. Both the publication of the UN model policy and the adoption of the resolution on sexual harassment represent key milestones in our journey to eliminate sexual harassment. Another promising step is seen in last year’s legislative changes in US states of California, Connecticut, Delaware, Illinois, New York, Louisiana, Massachusetts, Vermont, Washington and Maine which expanded legal requirements for sexual harassment training and education. Legislation in the state of New York, for example, now makes it obligatory for all organisations, regardless of size, to provide sexual harassment training for all staff, no matter their role or seniority. These legislation changes represent concrete commitments that extend beyond the federal requirement that employers make “good faith efforts” to prevent harassment and discrimination. This exemplary change sets the bar for governments across the globe. 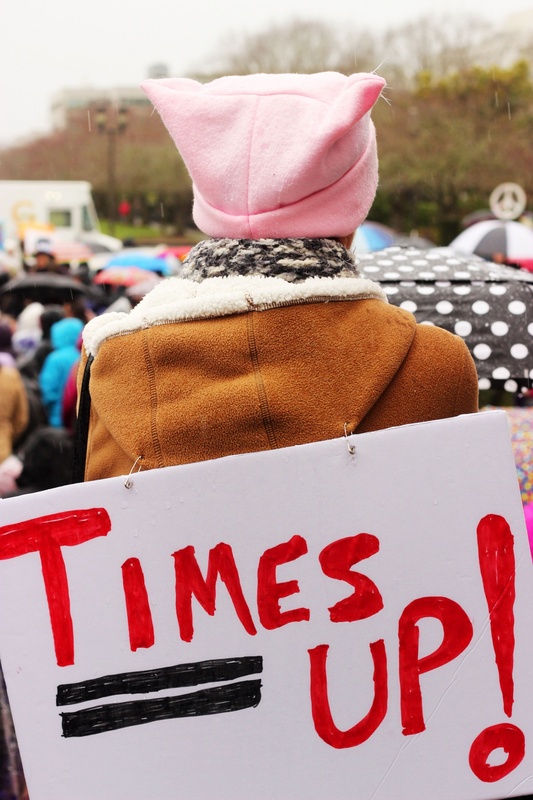 Finally, the wave of momentum generated by movements such as #MeToo and Time’s Up has prompted encouraging responses across public and private sectors. In March 2018, over 120 CEOs of US-based international NGOs signed the InterAction CEO Pledge on Preventing Sexual Abuse, Exploitation, and Harassment by and of NGO Staff. A wide range of actors from the United Nations, the UK Department for International Development and Oxfam to Microsoft, PwC and Condé Nast have introduced or remodelled their approaches and renewed their commitments to addressing sexual harassment, while others, such as Gillette and CBS, have made financial commitments to support the movement. In direct response to the findings of the 2018 GH5050 annual report, fourteen organisations made specific commitments to addressing gender inequality and a further ten shared their plans for their organisations. Such responsiveness and willingness to engage from both the private and public sector will be essential if we are to maintain and accelerate progress achieved by the movement to tackle sexual harassment. Will your organisation commit to doing better? The 2019 GH5050 Report: Equality Works will be published on March 7th, 00:00 EST // 05:00 GMT // 08:00 EAT. Email info@globalheatlh5050.org to be the first to receive the report.